As the local hospitals’ charity supporting patients at Bristol’s city centre hospitals, our mission is to make a real difference to patients, their families and the staff who treat them. We fund state of the art equipment, innovative research, staff training and the creation of a welcoming positive environment for everyone from Bristol and the South West treated in our hospitals. Each year we invest in projects that go above and beyond what the NHS can provide. Working with inspirational local people, our vision is to raise the funds needed to support the delivery of gold-standard healthcare in first-class surroundings in Bristol’s city centre hospitals. We aim to make a difference to every patient and every condition. Patients first: putting the patient at the heart of everything we do. 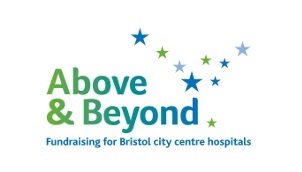 Above & Beyond is the local charity that raises funds for all of Bristol’s nine city centre hospitals. They invest in projects that make a real difference to over 840,000 patients from across the South West who are treated in Bristol’s hospitals every year. Whether it’s providing toys for the play centre at Bristol Royal Hospital for Children, funding the only Adult Bone Marrow Transplant Unit in the region, or providing state-of-the-art telemedicine facilities in Bristol Heart Institute, Above & Beyond works closely with hospital staff to make sure funds raised are spent where they are needed the most. “Thanks to the incredible support of the Thornbury Ukeaholics and your generosity, we have been able to provide the hospitals with over £2,600 for projects in support of patient care in Bristol hospitals. Each donation really does make the world of difference and we can’t thank you enough for your generosity. If you want to do achieve something amazing for charity and have fun doing it, go to see the Thornbury Ukeaholics, you won’t be disappointed!” - Amy Barnard-Smith, Community Fundraising Officer at Above & Beyond. I’ve just received your cheque for £210, thank you so much. You guys are absolutely storming it. I can’t believe how much you have managed to raise over the past year, it’s just been phenomenal!! I will ask Lisa to pop something on our Facebook page along with a link to our website and future gigs. I hope it will drum up some extra support for you all.